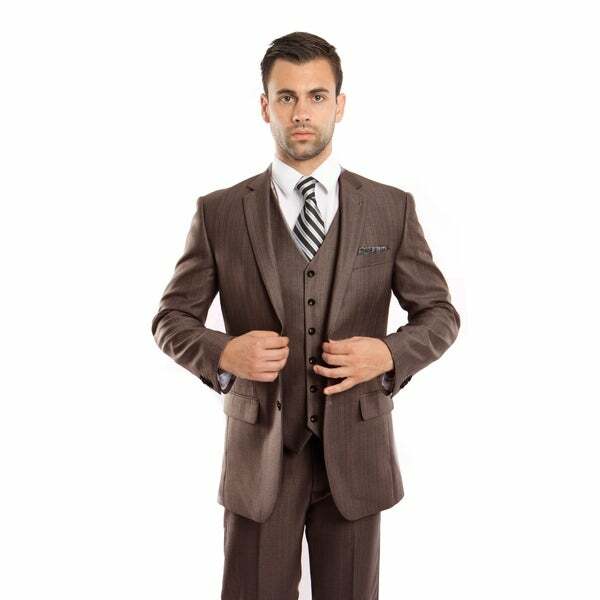 I received this suit in tan, instead of brown. I also received an ultra slim, instead of the modern fit. However, what I received is a very nice looking suit. Very summer and spring, formal/casual. The tan is a nice color for those of us living in Florida, or southern regions. Unfortunately, I'm sending this back for the right suit. But, I was very happy with what I received. Unfortunately, it won't fit me properly (being an ultra slim fit) and I've got two tan suits in my closet. If the brown looks and feels like the material of the one I received, I am going to be very happy!!! WE got this Suit and tried it on. My husband had been watching for this Suit to go down in price, when it did I ordered it right away. It came and got really nice. It was like the Suit was made for him. He got so many compliments on the style and fitting of the Suit. Of course he's watching for a few more Suits that he's been longing for. Thank you Overstock! I have just recently found your location on the web. I was searching for a place to purchase men's suits. I have made this purchase with no problems. Great fit - great style - at a great price - with very good service. I will purchase more suits and I will tell my friends. The Suit was sent back because it was sent as silver not stone colored. style - looks - color - and MORDEN FIT - 48l - and price.